JAKARTA, Indonesia (AP) -- Indonesia on Saturday ordered the immediate evacuation of thousands of people who for weeks have refused to heed the ominous rumblings of Mount Merapi and the burning lava oozing from its mouth. Hundreds of people began fleeing the 9,700-foot peak after authorities put the region on highest alert, having observed two days of steady lava flow. Bambang Dwiyanto, head of the region's volcanology center, said an eruption may be imminent. ''Because there has been constant lava flows that cause hot gases, we have raised the status to the highest level,'' Dwiyanto said. The crater had been relatively quiet for years until it began rumbling and spewing clouds of black ash a few weeks ago. 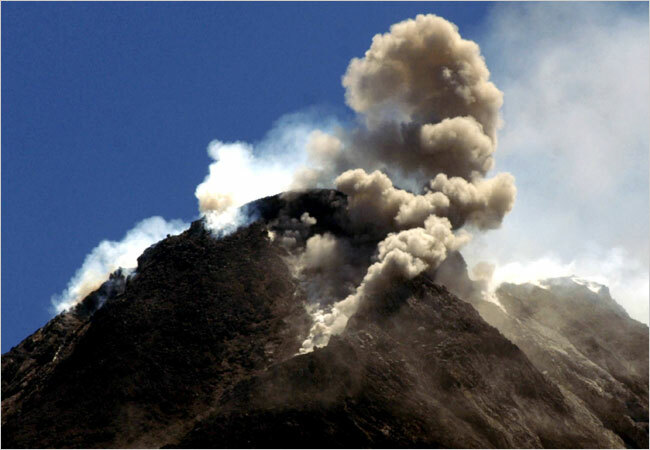 On Saturday, experts recorded 27 volcanic tremors, said Ratdomo Purbo, who heads an observation post on Merapi. He said the mountain belched hot ash at least 14 times over the course of the day and that lava flows reached nearly a mile down the slopes. Officials were using buses and trucks to relocate women, children and elderly to shelter in schools and government buildings elsewhere in the densely populated province of Central Java. Merapi, about 250 miles southeast of the capital Jakarta, is about 20 miles from Yogyakarta, a city of 1 million. Many people had been evacuated from homes closest to the crater prior to Saturday, but thousands who live further down the fertile slopes refused to leave. Officials have said as many as 7,000 people still needed to go. Even after the latest warning, some farmers insisted on staying, reluctant to leave previous livestock and crops. ''We will not leave soon,'' vowed one cattle farmer who declined to give his name. Merapi is one of at least 129 active volcanoes in Indonesia, part of the Pacific ''Ring of Fire'' -- a series of fault lines stretching from the Western Hemisphere through Japan and Southeast Asia. Many people who live in the mountain's shadow believe that spirits watch over the peak and will warn them of an eruption. Although most Indonesians are Muslim, many also follow animist beliefs and worship ancient spirits. Often at full moons, people trek to crater rims and throw in rice, jewelry and live animals to appease the volcanoes. Merapi last erupted in 1994, sending out a searing cloud of gas that burned 60 people to death. About 1,300 people were killed when it erupted in 1930.